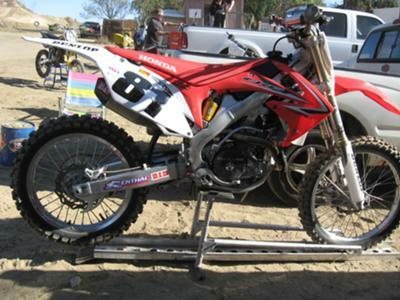 A unique aluminum motocross bike stand and ramp in one unit that fits all sizes, from 50 to 600cc. This allows sellers to carry one instead of two or more sizes to accomplish the same purpose. The unit can be sold as a complete ramp/stand package or an add-on to those that already have the ramp.